Giuseppe Verdi was an Italian Romantic composer, primarily of opera. Verdi was one of the most influential composers of the 19th century, and his operas dominate the standard repertoire, with several works such as Il Trovatore, La Traviata, and Aida dominating many of the most popular opera lists. Certain themes from these and other works have taken root in popular culture and may be known by non-musical listeners as well. Verdi was influenced by many different Italian composers who preceded him, including Rossini, Bellini, Meyerbeer and, most notably, Donizetti and Mercadante. Ironically, he composed mostly independently of Wagner's influence, with it present in only a few of his major compositions such as Aida. 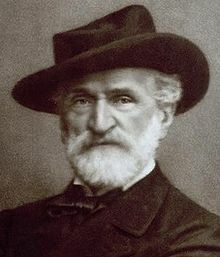 Verdi was known for bringing out some of the traditionally underutilized roles in vocal performance, such as those in the bass range. His orchestration also increased the scale and sheer sound of the instrumental parts, and many of his most famous works feature "power" vocals that paired with such orchestration, creating almost a new level of volume and magnitude for concert audiences. With the exception of Puccini, it can be argued that no other Italian composer of opera has matched Verdi in popularity or scope.